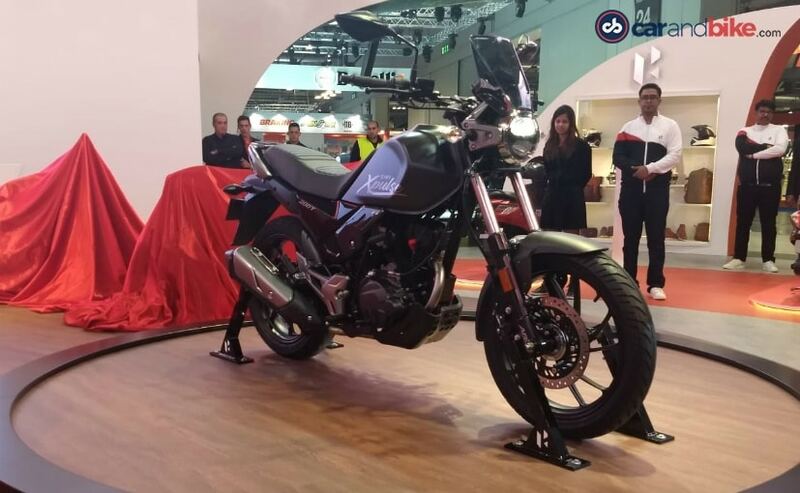 Hero MotoCorp unveiled the XPulse 200T at EICMA 2018, a model that will be going into production next year. The Hero XPulse 200T will be sold alongside the more adventure-friendly XPulse 200 with the launch scheduled for both bikes in early 2019. 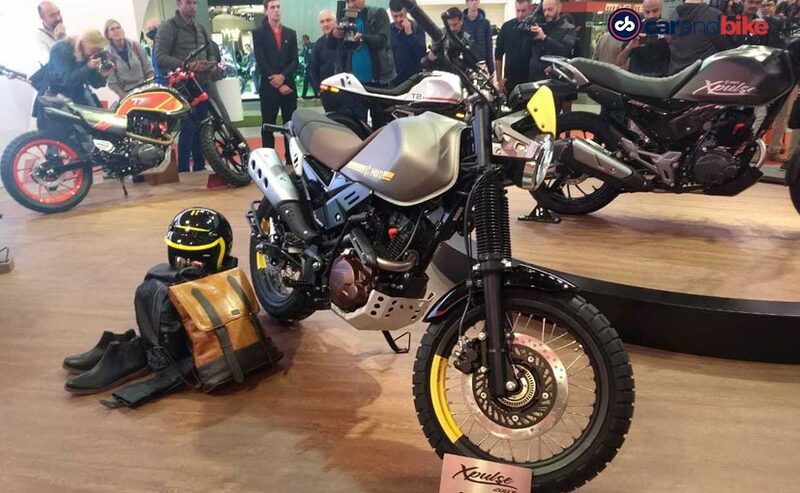 While this is the second outing of the XPulse at EICMA, the bike maker spiced up things this time with four new concepts based on the adventure motorcycle. 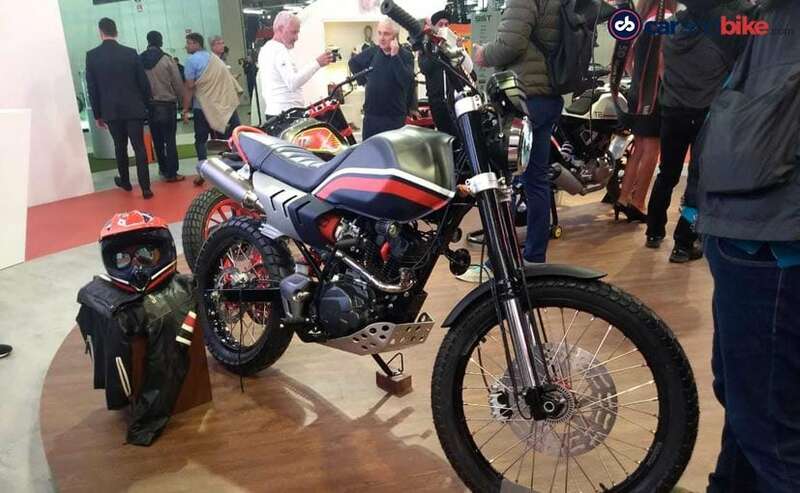 With the idea to showcase the capabilities and versatility, Hero XPulse based Cafe Racer, Scrambler, Flat Tracker, and Desert concept look intriguing. Increasing the stakes, Hero says that it will try and put one of these concepts into production, based on the votes each of these concepts receives. The company is also likely to offer a host of components separately across the XPulse range, as part of its new vertical - the accessories business. Let's take a closer look at what these models have to offer. The Hero XPulse 200T is a 'Tourer' and the has been reworked to be more rider-friendly when spending long hours on the saddle. Compared to the standard version, the XPulse 200T gets revised ergonomics for a more relaxed riding posture, while the load carrying capacity has been increased with its large luggage plate. The model will further differentiate itself with a 30 mm lower ground clearance, taller gearing, and different handlebar. The bike will ride on a 17-inch front wheel instead of a 21-inch on the adventure (ADV) version and a different setup for the suspension. It is also expected to ride on more tarmac-friendly MRF as opposed to the dual-purpose CEAT tyres on the XPulse 200 ADV. The feature list will remain identical with LED head and taillights, single-channel ABS, digital instrument console with Bluetooth connectivity and smartphone-based navigation. The Hero XPulse 200 Scrambler concept looks interesting and gets a bulk of changes to make it look minimal and off-road friendly. The matte grey paint scheme looks good on the concept, complete with the yellow highlights. Key design updates include front fork gaiters, aluminium finished bash plate, flat seat, and a wide handlebar. The bike rides on wire-spoked wheels and also gets a small fly screen mounted on the LED headlamp. Lastly, the high mounted side-exhaust comes with heat protector, and the concept does look ready for production. 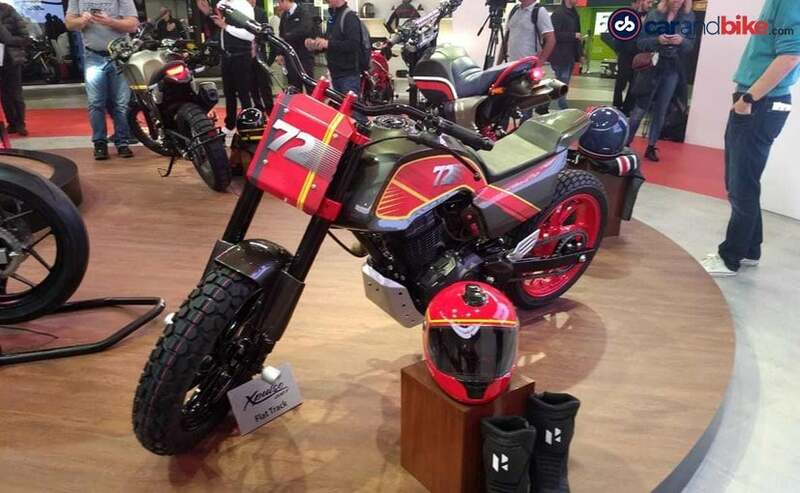 Meanwhile, the company also displayed Scrambler themed accessories alongside the bike including a half helmet, bags, ankle length boots and more. Bringing a retro feel to the XPulse 200, the cafe racer concept is well executed, and is in fact Hero's second attempt at making a cafe racer. The Hero XPulse Cafe Racer concept is finished in a white shade with red pinstripes and comes with golden USD forks, clip-on handlebars, and a single seat. The bike also gets LED indicators while the rear gets a minimal look with the taillight. 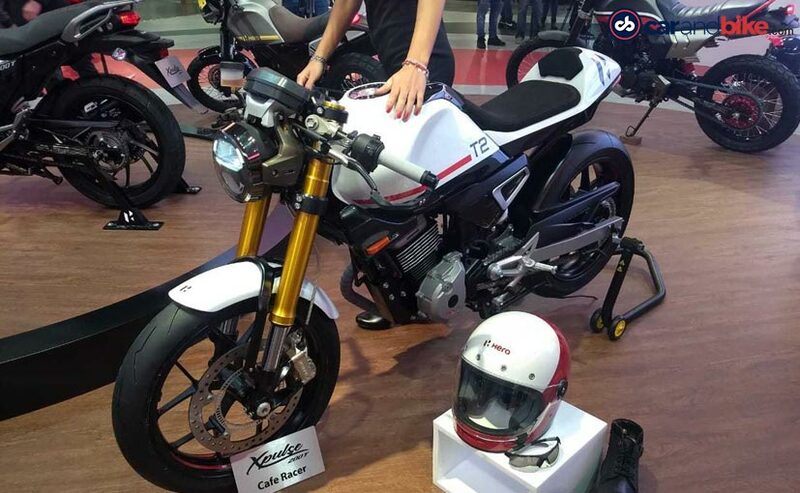 Hero also showcased a retro helmet and boots alongside the cafe racer concept. Another take on the retro theme, the Hero XPulse 200 Desert concept further adds functionality with the increased ground clearance, dual-purpose tyres, bash plate, and fatter USD forks. The seat is also narrower, while the bike now gets an under seat exhaust, with what seems to be a grab rail finished in red. The bike also gets a flat handlebar. The XPulse 200 Desert looks ready to tackle the dunes, while accessories include a motocross helmet and a leather jacket with the Desert concept. If you ever wanted to try out flat tracking, essentially going sideways on a motorcycle, the Hero XPulse 200 Flat Tracker just might be your answer, that too on a budget. The flat tracker would be a fun take on the 200 cc motorcycle with a wide handlebar, alloy wheels with a fatter rear tyre, serrated foot pegs, minimal seat, and a high mounted exhaust. The manufacturer also showcased riding boots and a helmet with the flat tracker concept. Hero says the four custom motorcycles "enables the company to develop and co-create new variants, which can act as the right vehicle to focus on specific customer needs and markets across the globe." The bikes will be drawing power from the same 200 cc single-cylinder fuel-injected motor tuned to produce 18 bhp at 8000 rpm and 17.1 Nm of peak torque available at 6500 rpm. 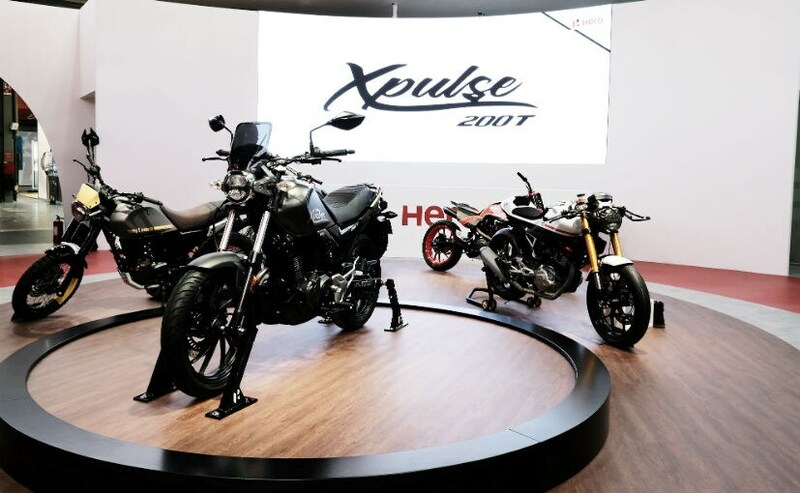 With the Hero XPulse 200 and XPulse 200T scheduled for launch early next year, the bikes are expected to be priced around the ₹ 1 lakh (ex-showroom) mark. The Hero XPulse won't have a direct rival when it goes on sale, which will make it a lucrative choice in the entry-level adventure and tourer segments.